Local Support Helping to Fuel NRHS! 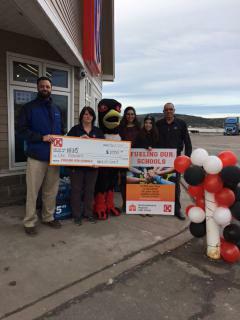 CCRSB would like to extend a huge thank you to the employees at the Circle-K in Westville who held a “Fuel the School” fundraiser earlier this month! Through “Fuel the School,” $1000 has been graciously donated to Northumberland Regional High School. We appreciate the support of the Circle-K in Westville and to everyone who fuelled up their gas tanks!